Are Grants offered by HUD Community Development Block Grant Disaster Relief CDBG DR right for your household? About 2 minutes and 18 seconds reading time for this 645 word page. This is a non-official report from victims of the 2016 Floods in Louisiana. Many of us have not been able to complete our rebuilding process due to the costs of repairs, our unmet damage needs and lack of insurance or federal funding. We also learned the hard truths about Restore.LA.Gov Louisiana's name for the Community Development Block Grant Disaster Relief program offered by HUD to disaster victims one year after the disaster. From experience we have learned that if you have one of the following you may not qualify for any amount of CDBG-DR funds. If you know what Duplication of Benefits are then you also know that your SBA Loan may actually be counted against you. Many suffered by the lack of clarity of our own laws that have been on the books for decades. Super Storm Sandy offered SBA Loans before CDBG-DR funds then after they opened the SBA loans under the RISE Act to cover any unmet needs. Here in Louisiana after the 2016 floods everyone that took the SBA Loan was disqualified by HUD CDBG-DR rules. Even if you were poor, fixed income, over 65 years of age, retired, home paid off, no flood insurance, etc. you were quickly disqualified for any reimbursement or support by the HUD CDBG-DR programs. For our neighbors in Texas, it appears the wording has changed but I'd like to point out that DOB (Duplication of Benefits) still looms over your heads. Be sure you use all your FEMA money for what FEMA requires you to use it for. It does not mean you can replace a TV or a Vehicle unless it clearly states, Contents or Vehicle. The "Home Repairs" does not include furniture, clothes, appliances, light fixtures or a new truck. If you spent the money on anything other than repairs to make your home livable this will later be counted against you when you apply for additional grants to complete your rebuild. RULE 1: Do not spend money you are not 100% clear on what you can spend the money on. Email FEMA and ask them each time you use that $16k or $30k, "Can I purchase a new TV and X-Box with my Repair money?" If it has anything to do with IHP (Individuals and Household Program) I'd bet it is to make your home livable again which doesn't include, food, water, clothing, bathrooms, bills, gas, flooring, tools, etc. It is only for you to fix walls, doors, close windows, fix electrical and when I say fix I mean the very least you can do because if you go off replacing all your drywall, (sheetrock) in your home that only flooded 18 inches you're going to find they will not justify your expense and use the DOB against you. 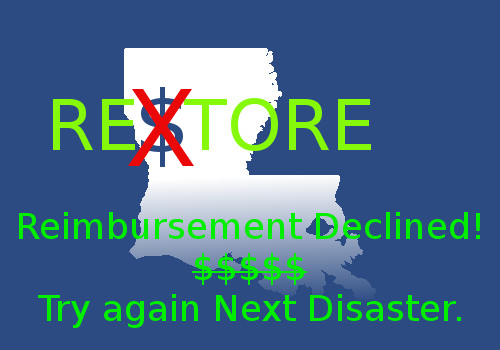 If you haven't spent your FEMA money then good, don't, wait one year from the disaster date and apply to your states program CDBG-DR. They always give it a name that helps you remember, your state might name it, RestoreTX but that's bad, Go with Rebuilding Texas . gov to make it sound even better than our program. I'll be adding facts and figures so you can calculate if you even want to wait for the program. We do know if you finish your repairs you best have receipts and lots of pictures and measurements of what you did. You have to prove to them what you spent the money on and it's not a new Refrigerator or new windows and metal doors. Trust me, what you spend today will be more than half of what they offer to reimburse to you later and that's if you're lucky.